Welcome back to Dog of Blogs! I hope you all had a well-deserved break and are ready to learn more about dogs in the newest installment of Blog of Dogs! 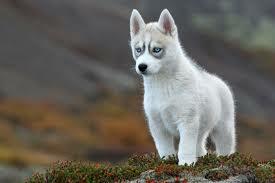 This week we will be focusing on the Siberian Husky! 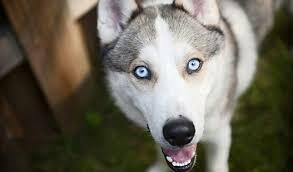 The Siberian Husky is commonly identified by their blue or multi-colored eyes as well as their wolf-like features. 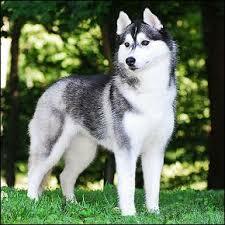 Huskies are very smart, athletic, and independent which can make them challenging for first time owners. Because of their athletic ability, it is very easy for Huskies to run away, so it is very important for Huskies to be in a fenced-in area. Huskies are one of the friendliest dog breeds, especially with families and kids. They are very agreeable and have an outgoing temperament which makes them good companions for kids. They also have good endurance and a strong willingness to work which makes them a great working dog, especially in colder climates. 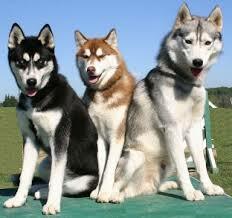 Siberian Huskies come from the “Working Dogs” breed group. They are a medium sized dog, ranging from one foot eight inches to eleven inches tall at the shoulder. They have a pretty wide weight range from 35 to 60 pounds. They also have a nice long life lifespan, ranging from 12 to 15 years if you take good care of these precious dogs. The Siberian Husky is believed to have originated among a tribe of Siberian nomads, the Chukchi. DNA tests have confirmed that Siberian Huskies are one of the oldest dog breeds, making their history pretty unknown. With this, it is known that the Chukchi used the Siberian Huskies for faster transportation in the cold weather. An even more important use of the Huskies is how helpful they were to families. For example, they slept with children to provide warmth and comfort in the cold weather and were able to help doing heavy labor around the house, like transporting things. In 1908, the Siberian Husky moved to Alaska and were used as sled dogs during the Gold Rush. Once they moved to Alaska, they became part of the All-Alaska Sweepstakes, which is a 408-mile dog sled race which is still continued today with the Huskies. The Siberian Club of America was founded in 1938 and the Siberian Husky was recognized by the American Kennel Club in 1930. Since Huskies are pack dogs, they need an owner who is a clear and firm leader. If an owner can establish themselves as such, it makes training much easier because the dog will respect and listen to the owner. It is very common for Huskies to challenge the limits of an owner’s position and even try to take control from time to time so it is very important to have a good grasp on a Husky. It is necessary to give a Husky plenty of exercise throughout the day because they are such a high-energy breed. If they do not have enough exercise and play time, they can be very destructive. Huskies are very social and love to interact with other dogs as well as people. One interesting fact about Huskies is that they do not bark, making for horrible watchdogs. Instead of barking, Huskies have a nice loud howl that can bother neighbors if not contained. As always, it is very important to socialize Huskies as early as possible because of how social the breed is. Going to dog parks, going on strolls through town, inviting people over, or even taking a Husky into a store are all great ways to socialize a Husky. This 408-mile race was originally made to help the gold miners in the cold winter weather of Nome, Alaska. During this time, the best mode of land transportation in the winter were sled dog teams. With this, people would bet large amounts of money on which sled dog team would get to somewhere faster. However, it was soon discovered that this race was not won simply by going fast, but rather, with strategy and special care to the dogs doing the hard work. The first couple of races did not have any rules but as time went on, more and more rules were added to this race in order to make sure that everyone involved was safe, humans and dogs. This is an entertaining and important race in Alaska that captures the attention of thousands of people. If you want to add a wonderful addition to your family, adopt a Husky now! They will be a great friend and companion as well as an amazing comfort with their warm fur! I have recently been thinking about what dog I want to get when I’m older, and one of the breeds I was exploring was the Husky. My family currently has a dachshund, or more commonly called a wiener dog. Although I find him adorable, personally I think I want a bigger dog. I’ve always loved golden Labrador Retrievers, but recently I’ve also really been exploring Huskies. This post was actually extremely helpful with the information you had and made me feel as if I know everything about the breed. I’m interested to see what other dogs will be written about and hopefully this will even help me decide which dog I want. I personally own a Siberian husky he is super energetic and he really likes to god for walks. I really liked the information because it has information about the breed , what they like to do, and they’re favorite things and it really helps me . Thanks to this blog I know more information about the breed and the dog itself. Almost every comment I read carefully about Siberian husky temperament. They are very interesting. I appreciate it. If you read kindly you would learn new thongs about husky temperament. Siberian Husky Temperament, siberian husky temperament intelligent or you can say siberian husky temperament friendly what ever say all are includes a family friend and pleasant temperament of siberian husky. This mild and friendly disposition is also a heritage from the past, since the Chukchi individuals control their dogs in nice esteem, housed them within the family shelters, and inspired their kids to play with them. The Siberian husky is alert, desirous to please, and pliant. An aggressive dog isn’t a team dog, and thus a lousy working dog. Siberians ar a very intelligent and freelance breed. they will be terribly stubborn, attributable to their original purpose, and that they are simply bored. This freelance and stubborn nature could from time to time challenge your ingenuity. Siberian husky temperament shows skillfulness makes him a pleasurable companion to individuals of all ages and ranging interests. However, this can be not a breed that’s usually suggested for first-time dog homeowners, as mistakes are simple to create and typically tough to mend with this remarkably intelligent and timeserving breed. and many more. This is such as site that a dog owner gets Total Solution of Dogs in single platform. So, I’d like to share my article. Every article is expert level due to for every article huge study and then published. A dog owner will be highly benefited by that article. I have a blue eyed Siberian husky that loves to play and loves to pose for pictures! He’s an incredibly cute husky! Husky’s are one of the most beautiful dog breeds that exist in my opinion. We are a husky breeder in Belgium with more then 25 years of experience. I should say that they are not the simplest dog breed, they need to build up trust with there owner.